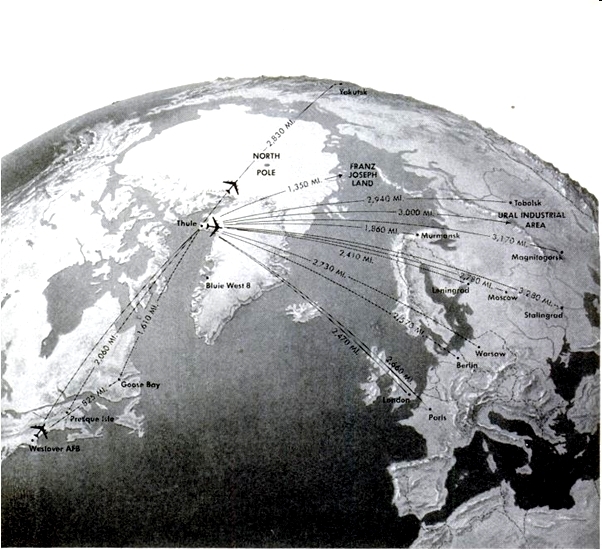 During the Cold War, Greenland was perceived by American military leaders as crucial for maintaining North American Continental Defense. Effective operations in this cold, remote, far northern location meant gaining crucial knowledge about the physical environmental sciences of the Arctic. [this was caption for book, page 32. Map by James Lewicki, first published in LOOK magazine 22 September 1952, page 130; reproduced courtesy of estate of James Lewicki and Lisa Lewicki Hermanson. R.E Doel, K.C Harper, M. Heymann, “Map of Thule Base,” Exploring Greenland, accessed April 19, 2019, http://exploringgreenland.org/items/show/7.